My mother lives in Burnham-on-Sea in Somerset, England. Just before Christmas, my mum was involved in a crash while cycling. She had right of way when turning right on a mini roundabout. A driver coming from her left drove into her without seeing her. My mother was following the line shown in red. The crash happened at the blue cross. See it on Google Maps. The driver who hit my mother is not a bad person. She was apologetic from the start, took my mother to hospital and has checked up on her since then. The driver also paid for repairs to the bicycle and admitted liability to the police. My mother was not seriously hurt, but her minor injuries have caused pain for some weeks now. A couple of days ago, my Mum collected her bike from the bike shop which made the repairs and rode it home. That's brave. Many people never cycle again once something like this has happened to them. While careful cyclists rarely have collisions anywhere in the world, including the UK, cycling becomes subjectively far less safe for people who have had this type of experience. Crashes like this are quite common in the UK. They're usually referred to using the word "SMIDSY" ("Sorry Mate, I Didn't See You") as that's what drivers say so very often to the people who they have injured. However, while crashes like this are common, they are rarely the result of deliberately dangerous behaviour. This is why neither legislation against drivers nor additional training are likely to make such events less frequent. Another view of the same location. 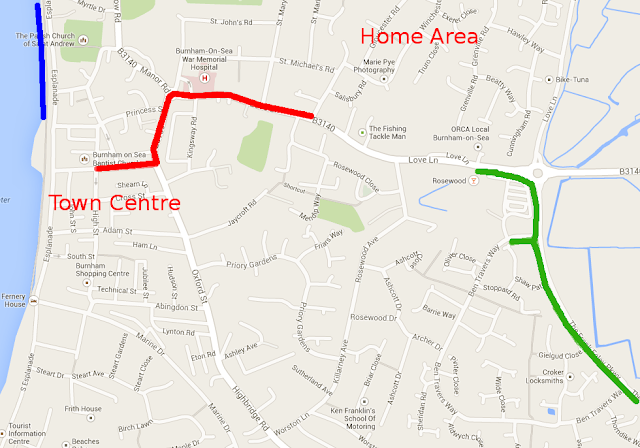 The red line shows the route that my mother takes to ride her bike home from the town centre. Who should we blame for this crash having occurred ? My mother is a very careful cyclist and was riding according to the highway code when the crash occurred so she can't be blamed. The driver of the car has to take some responsibility because it was her action which caused the crash. However it would be a mistake to think that these two parties are the only people involved. We need to look at why the driver made the mistake. This didn't happen for no reason at all, it was at least in part the result of the environment. Because crashes like this continue to occur I don't find it constructive to continue to blame either of the two principle actors. at this junction since we left the UK. This is a busy road junction yet it's designed as a mini-roundabout. 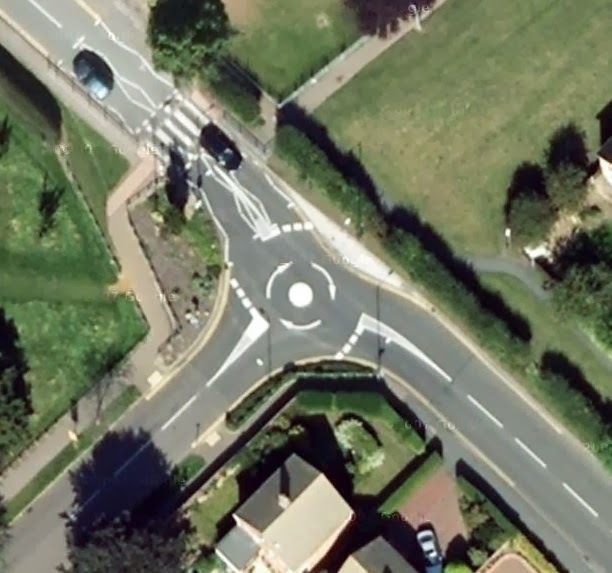 Mini-roundabouts like this can be quite efficient for motorists but many cyclists find them to be dangerous. On a mini-roundabout, people have far less time in which to make a decision than they do on a full-sized roundabout. This leads mistakes being made and makes it far easier for motorists simply not to notice bikes and their riders amongst the more common and far larger motorized vehicles. The speed limit at this junction is 30 mph (50 km/h). Burnham doesn't have any lower speed limits than this, not in residential areas which should not be used as through routes by car nor even by schools, even though schools exist for children yet children never drive cars to school. The petrol station adjacent to the mini-roundabout adds more uncertainty. This station has a total of three entrances and exits, one in a side road and two of which divert traffic onto and off from the mini-roundabout. Passing drivers may also be distracted by reading the advertised fuel prices. While both cyclists and pedestrians have no choice but to use this junction to get across the town, there is no provision here for cyclists to ride around the junction safely nor even to help pedestrians to cross the road. The mini-roundabout is in the distance in this image, this is the road along which my mother was going to cycle in order to get home. Is this an equitable way to allocate space ? Both the mother with children and the person in a disability buggy have to use extremely narrow pavements while drivers enjoy wide lanes. The closest safe provision for crossing the road as a pedestrian is behind the camera. Just like in other towns in the UK, planners here have only considered motor vehicles as a mode of transport. However, even that has not been done very well. The roads in Burnham-on-Sea are very typical for a British town. I rode across this junction hundreds, if not thousands, of times when I lived in Burnham in the 1980s and 1990s. There has been no significant change to the roads in thirty years. While British roads have not changed in design in the last thirty years, that is not true of the Netherlands. Sustainable safety principles applied progressively to Dutch roads in the ten year period between 1998 and 2007 are credited with having reduced the fatality rate by 5% per year. While the number of injuries for car occupants in the Netherlands is at around the same level as in Britain, pedestrians and cyclists are safer here than in the UK. Dutch children are far more likely to be independently mobile than British children and they are much safer than their British counterparts as they make their way around. Comparison of the same road as above in Burnham (left) and a similar road and junction in Assen (right). The overall width of pavement, cycle-path and road at this point in Burnham is somewhat narrower than the example from Assen. 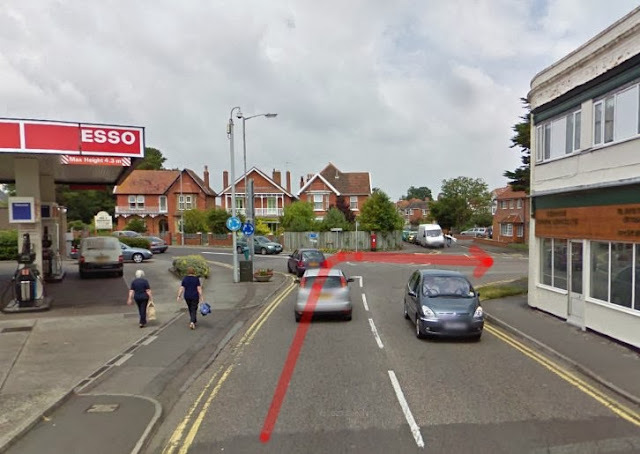 Nevertheless, despite having less space overall, the British example allocates more space for cars even at this narrow point: the driving lanes in Burnham are about as wide as the driving lanes in Assen and the car parking lane, even though no parking is allowed. Extra width could be allocated to pedestrians and cyclists even here, but that isn't done even further along the road where it's much wider. Note also the smaller corner radii into side roads in Assen to reduce speeds and make crossing easier and lower speed limits in all residential streets. The width of the driving lanes of this street in Assen were reduced in 2008. Burnham-on-Sea is a small town (the population is less than a third that of Assen at under 19000 people) but the roads in the town are always busy with cars. As in most of the UK, there is little alternative but to drive. Very few people will ever feel comfortable to cycle when the infrastructure design makes it so obvious that drivers are preferred over cyclists. In these conditions, people often believe driving to be a necessity. When we visited in October, we saw that cycling provision is still virtually non-existent in Burnham. Enthusiastic cyclists ride their bikes, but there is little to attract those who are not enthusiastic cyclists. Many of the people who we came across who cycled used the pavement and apologised for doing so, or avoided the direct routes by using back streets and narrow pedestrian only cut-throughs. The red line at the left shows part of the route taken by my mother to get from home to the town centre. 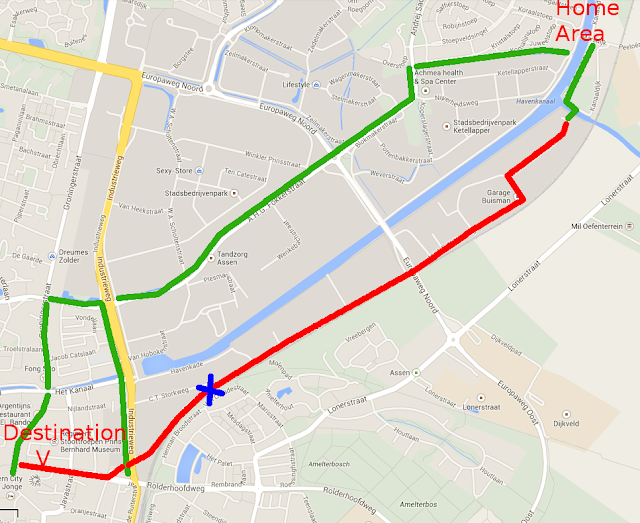 The green line on the right shows the only cycling infrastructure in this area, a cycle-path built on the edge of a new housing development on the Eastern side of the town. 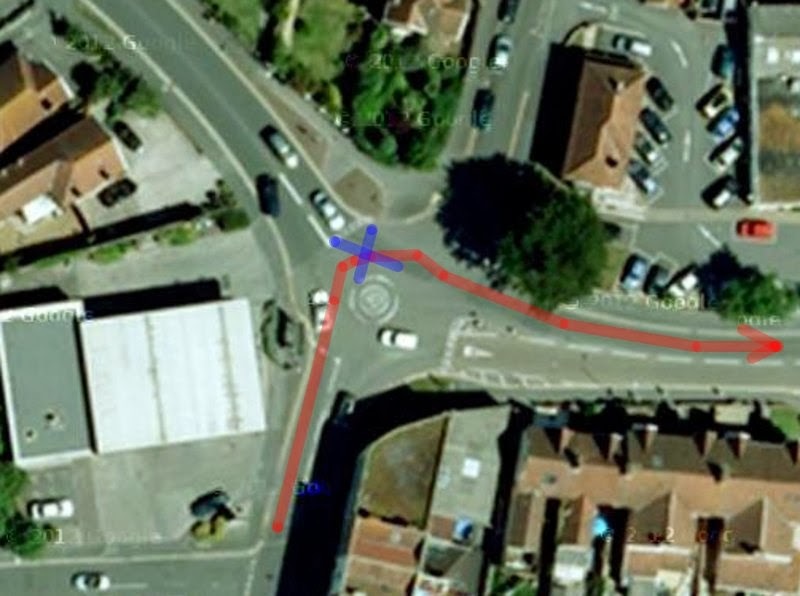 This single path is of relatively good quality by British standards but it's not very useful because it skirts around the town and doesn't provide a direct route to common destinations. A very finely spaced grid of high quality cycle-paths is required to enable safe mass cycling. The blue line on the far left shows where Sustrans tell cyclists to ride along the beach. A recently built housing development on the Eastern edge of the city provided a single cycle-path. However, this path is compromised in quality (narrow, gives way at all side-roads, low social safety) and doesn't actually go anywhere very useful. It skirts around the edge of the new homes where it was easy to build rather than going where it would provide a useful route. There's a stark contrast between the housing development in Burnham-on-Sea which is typical for Britain, and what we've seen with a new development built on the edge of Assen which is typical for the Netherlands. In the Dutch example, cycling is not an afterthought. Not only was this development designed to enable most children to cycle to school but the new suburb also came with all facilities including a pedestrian and cycle friendly shopping centre. What's more, not only does the new development in Assen have an extensive network of internal cycle-paths, but it its construction also involved extensive works to provide a direct, unobstructed and nearly car free route to the city centre by bicycle. Is everything perfect in the Netherlands ? We go to some lengths to point out, both on this blog and on the study tours, that the Netherlands is not perfect. While the overall standard of the Netherlands is very good, there are plenty of places in this country where the infrastructure is not yet up to scratch. Plenty of work remains to be done. We have observed that those places which have inadequate, old-fashioned, infrastructure are often the scenes of collisions. just as wide as those used in the UK. paths here to keep cyclists safe. This was illustrated in the last week because a friend of ours was involved in a very similar crash here in Assen to that which befell my mother in Burnham-on-Sea. Like my mother, our friend was bruised but not seriously injured. Her bicycle had some damage. The car driver in this case initially wanted to leave the scene of the accident but did co-operate. It's often the case that people from outside the Netherlands overestimate the effect of "Strict liability" law. This was not a deliberate act and law does nothing to prevent accidental crashes. The driver simply "didn't see" the cyclist when he used a junction to turn around. No change to the law can prevent crashes because they address the wrong issue. The law does provide the useful service of ensuring that the crash victim will have her bicycle repair paid by the insurance of the driver. Proper cycling infrastructure in this location almost certainly would have prevented the crash from happening because this removes the chance for a collision to occur. There is easily enough space for a cycle-path along this route and it is highly likely that one will be built in the future. The Western end of this area is to be rebuilt in the next few years and I expect to see changes for cyclists when that happens. The route taken by the Assen cyclist through the industrial estate is shown as the bottom line, in red. The location of the crash is shown by the blue cross. No-one used this as a through route until very recently when a new bicycle bridge joined the short green section of cycle-path on the right to the red road. There are many cycle-paths in Assen and they go to all destinations. The longer green line across the top shows one good quality route (mainly cycle-path) to the same destination. This shortest safe route is 0.8 km longer for this particular journey, hence the desire to save time by choosing the red line. As the red route now makes a useful bicycle through-route, it is imperative that a cycle-path is built alongside it to improve safety. is no more safe here than in the UK. Bad infrastructure in the Netherlands is no more safe than is bad infrastructure in the UK. Where conflict is caused by road design, problems of safety also arise. In the post second world war period, the Netherlands and the UK were transformed by the rise of the private car. Starting in the 1970s, the Netherlands took a different path. Some forty years have now elapsed of this second phase of transformation. People now take priority and road safety has improved by a huge margin. In some places, old fashioned and unsafe infrastructure remains in the Netherlands. In the case of the street featured above, it affected relatively few people until the recent opening of a cycle-bridge made it into a short-cut for some journeys by bike. It is now important that this street too needs to be updated to make it safe - part of an on-going process. Just because something exists in the Netherlands, that doesn't mean it works well for cycling. Many things can be found on the road network of the Netherlands or are promoted by Dutch companies but that doesn't mean it's a good idea to copy all of them. This is why we offer independent advice about infrastructure. We're in a unique position to understand and explain, having experience of the UK and the Netherlands, and we have no company's product to sell. My mother and Kona are not the only cyclists in Burnham-on-Sea. This town is also home to the world's oldest triathlete. On the theme of the last paragraph above, some may remember that I criticized a Dutch company last year who offered "Dutch" infrastructure which was not the same as they would build in the Netherlands. Public companies are amoral. Just because they have Dutch roots that does not mean they're interested in cycling. Profit is their motive. The same company has now become involved with achieving consent for a shiny new nuclear power station just 10 km from my mother's home. That's not very "Dutch" either - there are no nuclear power stations under construction in the Netherlands near the mothers of the people at the top of Royal Haskoning.